As the US National Committee of the International Commission on Large Dams (ICOLD), the United States Society on Dams (USSD) is the nation’s foremost organization for advancing the role of dams and levee systems in America, as well as for building the community of practice among the thousands of professional engineers who work on dam and levee systems across the nation. USSD’s efforts are aimed at effective Advocacy as a champion of dams and levee systems; efforts to Educate the media, the public and policy-makers about dams and levee systems and become their resource for information; enhancing Collaboration among all stakeholders with interests in dam and levee systems by building networks that allow us to share information and best practices; as well as to Cultivate and nurture the growth of the community of practice in our industry. Many people recognize that dams commonly provide multiple benefits, including but not limited to water supply, flood damage reduction, hydropower, navigation and recreation. In light of the current devastating drought and growing population in the far west, there is an unprecedented need for both new large regional reservoirs as well as small local reservoirs in California and other western states for the water supply benefit alone. However, today, we’d like to approach the question of the future development of large or small dams and the issues specifically confronting hydroelectric dams in light of the Environmental Protection Agency’s (EPA) Clean Power Plan. In 2015, the United States generated about 4 trillion kilowatt-hours of electricity. 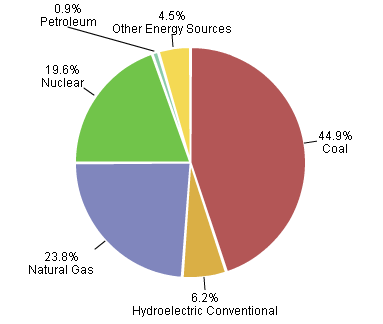 About 67% of the electricity generated was from fossil fuels (coal, natural gas, and petroleum). / Americans love electricity and our demand for it continues twenty-four hours a day, virtually unabated. As a nation, since the 1970’s we have made enormous progress using electricity more efficiently, though we still have far to go. In August of 2015, President Obama and the EPA issued a policy document that calls for the greatest fundamental change in how we generate our electricity since the 1970’s. The overall direction of the CPP is to reduce the nation’s reliance on coal, oil and even natural gas and stresses the increased reliance on renewables; with a heavy emphasis on wind and solar. However, the single largest contributor to the nation’s renewable energy production today, 51% of our renewable portfolio, is hydro – a subject not heavily emphasized in the CPP’s more than 1,500 pages. FERC currently regulates 2,540 hydroelectric dams in the U.S., and, despite a growing reliance on imported hydropower from sources in Canada, the U.S. will need every hydroelectric dam it has and then some in order to meet the ambitious goals of the CPP. These goals include achieving, by 2030, cutting harmful carbon pollution from the power sector by 32 percent below 2005 levels, giving states and utilities both time and flexibility to develop strategies that work for their specific needs and that are essential for clean energy innovation. Given the importance of our existing dams, however, new projects large and small face headwinds even with the need for more clean, renewable energy. FERC and State permits are often opposed with legal challenges questioning the potential impact to species, interpretation of water rights limitations, and other barriers that can impede the financial and/or technical viability of the project. USSD and its partners across the country look forward to engaging the public, media, and policymakers with discussions about how we balance our growing need for clean, renewable hydropower that enables compliance with the Clean Power Plan while at the same time protecting the environment and important wildlife habitat.